Segways look like something out of The Jetsons and should never have evolved from a drawing on paper to a working model. The Danish police don't seem to fancy them either. They're cracking down on Segways in Copenhagen. A company Segway Tours CPH have been running Segway tours of the city. 399 kroner, according to their website. They've been running the tours for a year or so. But Segways are illegal in Denmark. They're not approved by the Danish Transport Authority. So it wasn't odd that last week the Danish police cracked down on a Segway tour. The riders... or I suppose we should call them 'standers'... were instructed to walk their machines back to the tour office and the company was told that they would get a fine if they were spotted on the streets again. According to an article in the Danish daily, Politiken, Segway Tours CPH bought nine Segways for 400,000 kroner when they opened. They had expected the approval from the Transport Authority to take six weeks but it's still in the process. Three years and counting. The problem is how to categorize the vehicles. Sidewalks? Bike lanes? Roads? Where do we put them? What ARE they? Another Segway company in Copenhagen has halted operations until closure is reached in the case. 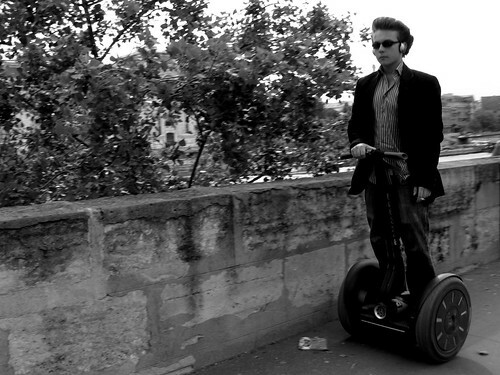 The police have not cracked down on Segways before because most police officers weren't aware of the lack of approval. But now the police are on it. Fortunately, there are ample opportunities to rent bicycles in Copenhagen if you're coming for a visit. When in Rome, do as the Romans do. It's green, it's cool, it's safe and easy.